Push blocks, press buttons, collect shinies! Wyv and Keep: the Temple of the Lost Idol (henceforth WaK) is an indie platforming game that Jason previewed over a year ago. It follows two treasure hunters, Wyv and Keep, on their adventures to and through an ancient temple. It’s a puzzle platforming game which features block-pushing and button-pressing mechanics across 60 levels. The goal of each level is simple: open the door and have one character reach it to beat the level. It becomes more difficult than it sounds. 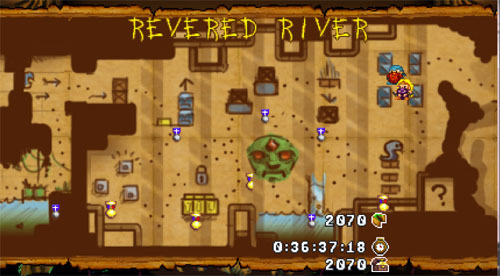 After a level has been cleared, players are scored on treasure collected, number of retries/deaths, and completion time. The game plays the same in single-player or two-person co-op, which basically means drop-in/drop-out support to the max. The default set-up is local with one keyboard controlling both Wyv and Keep. Player 1 uses WASD, Player 2 uses the keyboard arrow keys. While I’m usually not a fan of two players using one keyboard to play a game locally, WaK is one of the very few games I found it actually worked with. The 360 controller is also supported for play, but as I don’t have a wired 360 controller, I didn’t experiment with that. Also, online play is also supposed to be supported, but at the time of play it was down while the devs ironed out some kinks. The graphics for WaK are delightfully retro, featuring a pixelated art style that is astonishingly detailed. While playing the game, I was very impressed with how much detail the artists had managed to imbue into the surroundings and especially Wyv and Keep. Wyv and Keep have multiple facial expressions throughout the game (whether in scripted events or idle animations) that never fail to successfully convey the correct emotion. WaK definitely succeeds in a number of ways. The level design is absolutely spot on with puzzles that get progressively more challenging throughout the game. Order of events, block placement, and timing are eventually all blended in together to make some very challenging, but ultimately satisfying, puzzles. New mechanics are added in at just the right times so the puzzles never feel stale. The idle banter between Wyv and Keep is also pretty amusing. Also, an “Easy Mode” is supported for players who want more of a puzzle-lite experience. Though I didn’t mess around with it too much, the puzzles are supposed to be the same with some elements removed (e.g. less buttons or blocks) to make them a bit easier to solve. Complaints I had about the game were fairly minor. Sometimes the simple control scheme (up, down, left, right) felt a little hindersome when it came to making some tricky jumps, or getting some very precise timing down. I also wasn’t a huge fan of the scoring system and eventually began to pretty much ignore it. Most of the puzzles took me and my partner multiple attempts to complete (as I feel was completely intended), so I felt that the score for retries/deaths was a little silly. Players can always go back to the same puzzle later and attempt a better score, but in my opinion most of the satisfaction is taken out of the puzzle once I know how to complete it, so I probably wouldn’t go back to do it again purely for the reason of a higher retry score. Last, though the game is completely available to play in single-player, as I mentioned, I don’t think I would ever play it that way. Later in the game, some intense synchronization is required between the two characters, and I’m doubtful I could pull it off reliably on my own. It’s definitely best as a co-op game where the two players can talk to each other about their plan of action. I honestly think it’s probably best as a local co-op game where players can point at the screen to more quickly demonstrate their ideas. 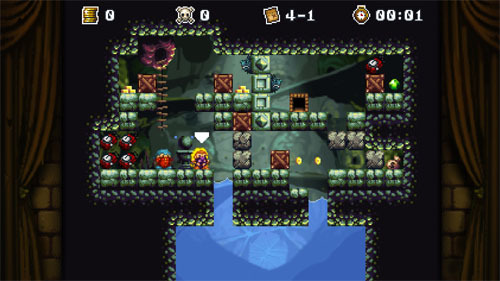 WaK is the solid game with adorable sprites and intense puzzles. It has some minor flaws, but these are easy to overlook with its stellar level design. Any puzzle platformer fan will likely not be disappointed. WaK is available DRM-free on Windows, Mac, or Linux via Desura with a free demo also offered. This review is based on a copy of the Windows version of the game, provided by the developer. The Co-Op Experience: One person controls Wyv and the other Keep, cooperating to solve puzzles and stay alive. Page created in 0.6836 seconds.